Kenritsu Tsutsujigaoka Koen is located in east downtown Tatebayashi and on the Tatebayashi-Oura Plateau. 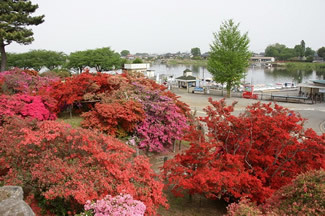 The park has a long history dating back to the Edo era (1603-1868). It attracted many visitors already at the time. Today, it is filled with more than 200,000 people who come to enjoy azaleas from across the country between mid-April and early May when azaleas are in full bloom.